On viola and reel-to-reel tape recorder, James Rushford and Joe Talia performed an improvised work of deft subtlety and stealth. Using a vocabulary of sounds that drew attention to subtle imperfections—scratches, whispers and glitches—this work maintained focus, despite its ephemeral gestures. What was most impressive about Talia and Rushford’s performance was the sensitivity they shared toward the sounds they produced. Never at odds with each other, the music they created was free to move in any direction at any time—to lash out from its predominantly restrained state into moments of extreme violence and intensity. On the second evening, the program opened with Jon Rose’s Palimpson—a solo act that conveyed a similar sense of exploration. Performed on what might be described as a ‘meta-violin’—the instrument expanded through four audio channels and employing a diverse palette of interactive, electronic effects—Rose’s work was unrelenting in its kinetic energy. Despite the intensity and complexity of the sounds produced through these electronic effects, Rose, as a performer, was never overwhelmed, always interacting physically with this complex onslaught of sound. Anthony Pateras’ Crystalline, performed by Atticus as a string quartet, is a composition about stark contrasts and transitions. For the performers, this work was highly challenging, not only in its intricate and complex rhythms, but in the challenge to convey a structure that takes a series of unexpected turns. I found it difficult to engage with on its first performance, however on the second evening the energy of the performers and the work itself were more convincingly aligned. Cat Hope’s Cruel and Usual Punishment, commissioned especially for this program, displays a fascination with frequency. It transforms the role of stringed instruments from the producers of ‘notes’ to frequencies, free to glide outside the chromatic spectrum. Although I felt that it could have evolved further, this work provided an ambience and spaciousness that offset more frenetic works on the program. Rose’s The Long and Short of It, an emphatic statement on Australia’s cultural identity, seemed to resonate through the program as a whole. Taking audio and footage from The Great Fences of Australia project, in which Rose and partner Hollis Taylor perform on wire fences with violin bows, The Long and Short of It is a work that is overwhelmingly about place—about the vastness of our landscape, and a music that could not possibly come from anywhere else. 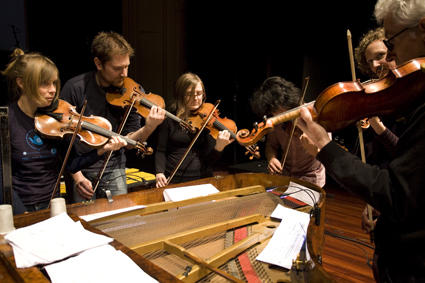 Using a series of cue cards, Rose directed a small ensemble of string players performing a series of quasi-improvised passages. A curious phenomenon occurs in Rose’s work; the more heavy-handed his approach to what seem to be crudely formed ideas, the greater their clarity. This was evident not only in The Long and Short of It, but in Palimpson as well. Traces of Rose’s influence can be heard in Hope’s and Pateras’ work—all three composers produce work that rails against the conservative mainstream, and that pushes its material to the utmost extreme. Jani Christou’s Metapraxis provides a glimpse as to where this sentiment has its roots. This work is a commentary on the highly theatrical nature of concert music. There is a heightened sense of drama and urgency here, due not only to the frenetic, contrapuntal string writing that dominates, but in the way in which the composer dictates the physical mannerisms of the performers and directs them to various locations within the performance space. Once again, Atticus drew on a team of associates to realise this work. There was a dream-like atmosphere to the performance—a surreality in which the work transcended musical performance, becoming an entirely new form of theatre. Metapraxis embraces the experimental underground with an agenda to perform music that is deeply connected to our time and place. It challenges not only musicians to collectively expand the stylistic vocabulary of their work, but also asks us who we are as audiences and the kind of values we would like our music to reflect.